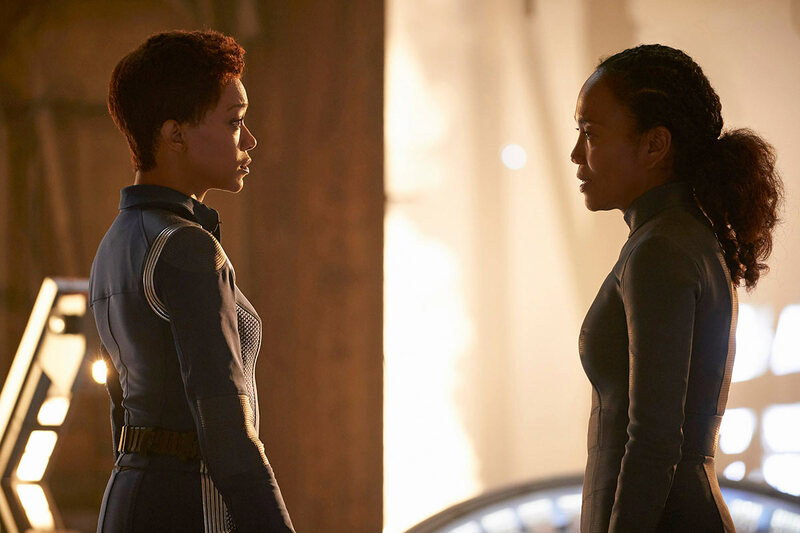 Previously on Star Trek Discovery: The Discovery crew was on a mission to capture the Red Angel, whom Tilly (Mary Wiseman) believed to be Michael (Sonequa Martin-Green). Leland (Alan van Sprang) disclosed that he was responsible for the deaths of Michael’s parents, so she punched him in the face. 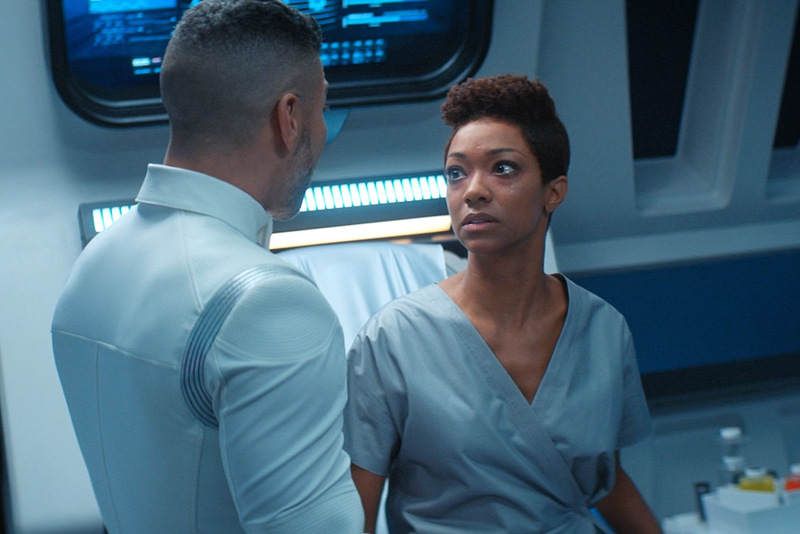 Burnham took her resentment for Section 31 and Leland and projected that onto Tyler (Shazad Latif), who continued to defend his choices. 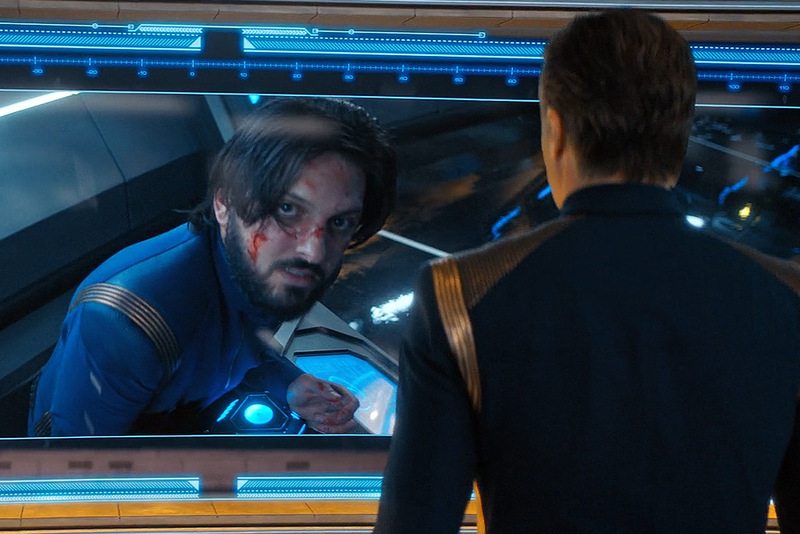 Pike (Anson Mount) was concerned that the AI which had infected Control was just laying in wait, and it appears he was correct, because Leland’s own ship stabbed him in the eye. Burnham volunteered herself to be the bait in the Red Angel trap, and it worked. But the Red Angel wasn’t her – it was her mom (Sonja Sohn). Present Michael wakes up in Sickbay, attended by Dr. Culber (Wilson Cruz), now back in his white uniform. She tells Pike and Georgiou (Michelle Yeoh) – who are also there because medical confidentiality doesn’t exist in Starfleet – that she thought she saw her mother, but knows that couldn’t be possible. They had bio-signatures and everything. Not exactly. There are significant similarities between mothers and daughters, mitochondrial DNA and all that. Georgiou tells her plainly, “It’s your mother.” Michael first can’t believe it and then demands to see her. But her mom is still down on Essaf IV, unconscious. 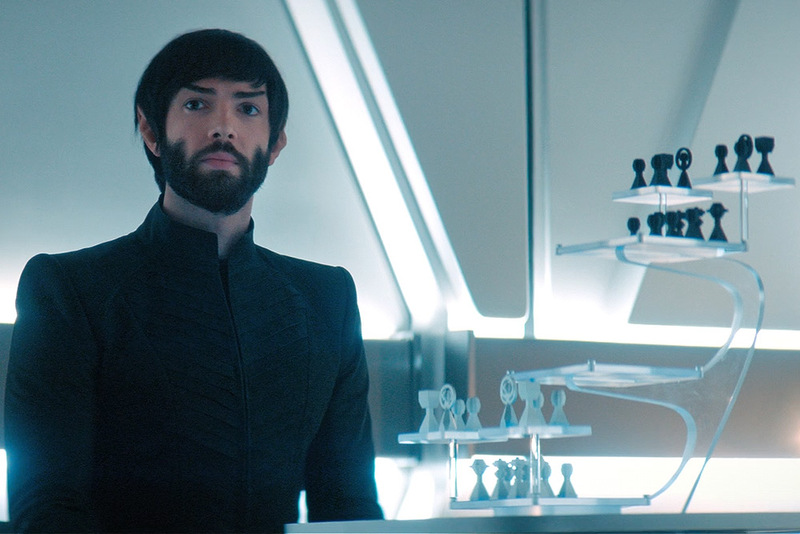 Pike tells her to be patient, which she claps back at, just as Spock (Ethan Peck) enters to sass her. But actually, he came to tell Pike that they’ve downloaded years’ worth of mission logs from the Red Angel’s suit. 841 to be exact. Control, currently appearing holographically as Burnham, has Leland strapped into an examination chair of some kind. Control claims that, when it appears in holographic form, it is indistinguishable from a biological entity. But that’s clearly not true – Saru (Doug Jones) has already figured it out. 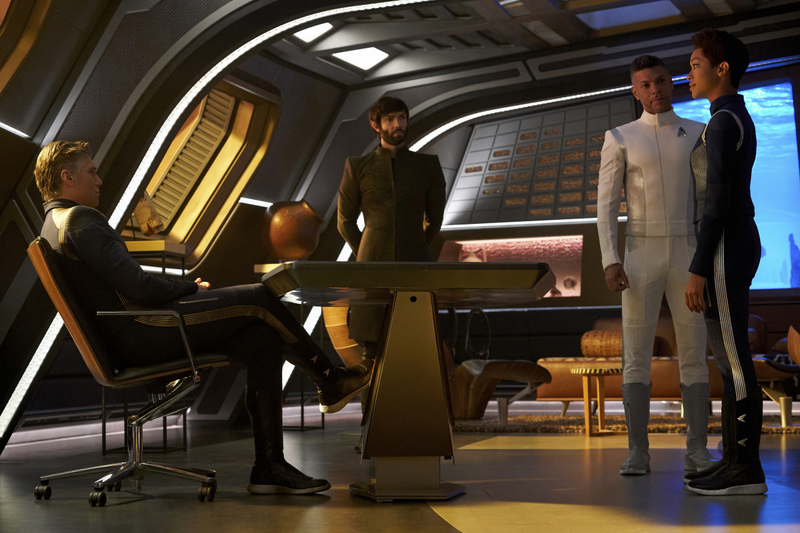 But Control things is can use Starfleet’s size and command structure to fly under the radar, and eventually bend everyone to it’s purpose – as it changes to appear as Pike and then Saru. Impersonating a Vulcan was easy, and infiltrating Airiam’s augmentation was certainly convenient, but now it needs a body – flesh. So now it’s going to take control Leland, because of the freedom he can operate with due to his unique position. Control injects Leland with something that looks a lot like nanoprobes, and which have an effect that looks a lot like assimilation. Are… are they going for a Borg origin story? We don’t have one canonically. All we know is that they’ve been evolving for hundreds of thousands of years (TNG “Q Who?” and Star Trek: First Contact). And we’ve already got a time travel element built into this story. Also, am I the only one who’s sick of the Borg? Michael is watching her mother’s logs from the night of the Klingon attack on Doctari Alpha. She see’s her mother put the time crystal in the suit, step into it, and attempt to jump back just one hour, so they can evacuate. But just as she initiates the time jump, the Klingons break in and hit the suit with disruptor fire, and Dr. Burnham finds herself floating in space, 950 years in the future, and the log abruptly ends. Michael continues to watch the logs, chronologically, looking for any information that could help them come up with a plan. Tilly is detecting gravametric instability on Essaf IV – Even though they’ve been able to hold Dr. Burnham here, she’s still tethered to the future, and the universe is trying to get her back. They’ve got about an hour before they loose containment and she’ll be pulled back, so it’s time to Culber to wake her up. Leland storms onto his bridge, declaring that be saw Gabrielle Burnham’s dead body with his own two eyes on Doctari Alpha, so this can’t possibly be her. It’s a clone, or replica, or something else entirely. What if she’s actually working on behalf of Control to get the sphere data? Tyler and Georgiou seem skeptical of these accusations, but trust Discovery‘s crew to handle whatever comes up. Leland doesn’t. He’s created a secure storage area in their databanks that Control can’t access, and believes that Section 31 needs to be the ones protecting the sphere data. He sends Tyler to Disco to get that data, and Georgiou remarks on how… “resolute” he is. Michael continues to watch her mother’s logs. Dr. Burnham built herself a home base on a world with no pre-existing technology, keeping her safe from the AI. But her efforts to stop Control in the past have all failed. But she has been able to help people – like those of Terra Elysium – so she knows that the future can be changed. And she decides to get Discovery involved, putting the Sphere in their path, in the hopes that they could keep its data safe. Spock interrupts to let Burnham know that Culber is about to give a report, and Dr. Burnham is awake. Turns out that Dr. Burnham wants to speak with Pike, and only Pike. Michael can’t handle that. While Burnham struggles with the fact that her mother doesn’t want to see her. Culber reminds her that her mother might no longer be the person she once was, and he would know. Pike holds his ground. It’s more important to him that they establish trust than host a family reunion. So Pike beams down, to find the research station shaking. It’s taking more and more energy to hold Dr. Burnham here, and that energy is going to run out. Pike approaches Dr. Burnham, but she provides his introduction for him, even dropping in that “soon you’ll return to your ship” and that he probably wouldn’t like to know more about his future (alluding to “The Menagerie”). So they talk about the issue at hand as Michael watches from the ship via video feed. Every time Control gains access to the Sphere data, it means the end of all sentient life, no matter what, and she needs to keep trying. Pike asks for the meaning of the red signals, and Burnham has no idea what he’s talking about. All she wants him to do is delete the Sphere archive. “Protecting” it doesn’t work. And if they miss even one thing, Control will gain sentience. So they need to listen to her. Saru is horrified at the idea of destroying all of the knowledge gained from the Sphere, and rightfully so, IMO. But Burnham insists that it poses a threat. Tyler, turning on his little clandestine recording device, posits that perhaps Dr. Burnham’s intentions are less than noble. Michael passionately defends her mother and her pursuit of facts. Tyler turns off his recorder, Pike agrees with Burnham, and Saru begins to delete the data. Except that the data core won’t allow it to be deleted. The archive is encrypting and firewalling itself. Spock has found Gabrielle’s log from shortly after she discovered that she could communicate with him. It was his unique combination of logic training, human emotion, and L’tak Torai (dyslexia) that allowed for him to process atemporal dysplasia and gave him the psychological balance to comprehend it. In true Trek fashion, it was the traits Spock considered failings that turned out to be his superpower help him save the day. He and Michael continue to find common ground, and he agrees to help her convince Pike to allow her to speak to her mother. Tyler calls over to report in to Leland, who reminds Tyler that he’s the only one standing between the Red Angel and the Sphere data. But the data won’t allow itself to be deleted and Tyler doesn’t feel right about spying on Disco, and he’s not going to do it anymore. Leland’s tone shifts suddenly, and he tells Tyler that he made the right call. Tyler is to stay on Disco and keep Leland in the loop. Weird. Pike has decided to let Michael beam down and speak with her mother – she has a plan to get additional information. But Gabrielle doesn’t want to see her. While Michael is awestruck, Gabrielle just wants to know if they were able to delete the archive. Which, of course, they weren’t. Michael wants to ask about her dad, but mom stops her. Gabrielle has seen so many different timelines and outcomes (and watched Michael die over and over) that all end the same way, that she thinks this meeting is meaningless. But to Michael, it matters. Gabrielle knows that her daughter doesn’t want to let her go, but if they ever want a real reunion, to “have this conversation one day – the right way,” they need to let her go so she can try again to alter the future. Stamets (Anthony Rapp) has tried to increase power to the containment field, but the gravitational pull is also increasing, so they still only have 43 minutes left. Spock has an idea – well, more of a metaphor – but the idea is to send the sphere data so far into the future that Control can’t get access to it. The Red Angel suit has quantum computational power, and more than enough space to hold the data. They’re going to transfer the data into the suit, program a destination point even farther in the future, and “let the wormhole take it forever.” But what happens to mom? Severing her tether to the anchor point will take an enormous amount of energy, so it’s a good thing they have some dark matter particles laying around. They can modify a transporter enhancer to pierce the time stream and beam Dr. Burnham into their space-time permanently (look, I’m just really bothered by the usage of “space-time” in this way, but I’m gonna go with it, even if it makes my skin crawl). According to Leland, Dr. Burnham cannot be allowed to stay at this point in time. Georgiou is surprised by how threatened he is. But she exists across time. She has too much knowledge and too much power. 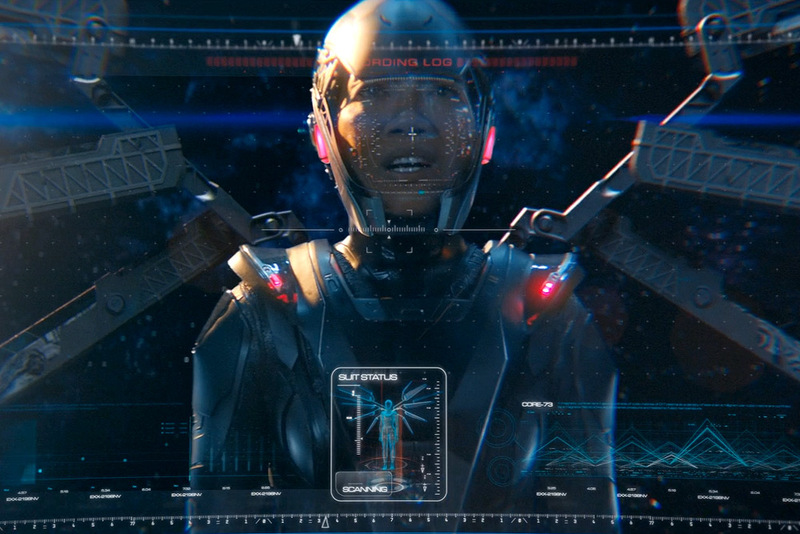 She “poses an unacceptable risk to the larger mission.” Leland, playing on Georgiou’s own ego and her supposed thirst for power, gives her a device to plant near the Red Angel suit which will allow the Section 31 ship to steal the data transfer and self-destruct went the download is complete, destroying the suit. Gabrielle notices her suit activating, and asks the security camera what’s up. But Georgiou deactivates those cameras for their little chat. She plants the amplifier and spills the beans about Discovery‘s plan. And Gabrielle spills the beans about Georgiou’s true nature, despite coming from the Terran Empire. On the Section 31 ship, the sphere data download has begun, and Leland’s nanoprobe vein makes a quick appearance. 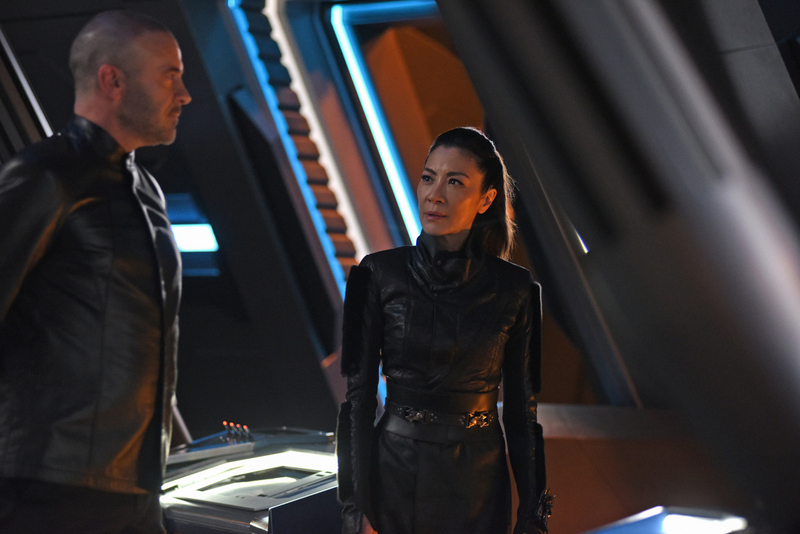 Before Georgiou leaves, Gabrielle wants her to promise to take care of Burnham. She knows that the AI will always be after her, since it considers her “an unacceptable risk to the larger mission.” Ding! Michael and Stamets beam down and know immediately why they’ve lost their video feed. As Georgiou departs, Gabrielle compliments Michael on their plan, and she’ll be able to guard the archive. Oh, but they’re going to beam her into the present. Nope, uh-uh. Someone needs to protect the data. Georgiou contacts Tyler, now back on the Section 31 ship, via a secure channel to check how much data has been downloaded so far (22%). Georgiou’s about to tell Tyler some stuff, but warns him that she will kill him slowly if he betrays her. In perhaps his most badass moment to date, Tyler replies, “I’ve been killed before, Georgiou; You’re just telling me I’ll have time to enjoy the scenery.” She closes the channel. Stamets has completed his modifications, and they should now be able to beam Dr. Burnahm our of “her native space-time” (shudder), but they’ve only got one chance. Then they’ll shut of the containment field and the suit will head back to the future. Before the attempt, Gabrielle reveals that she’d been watching Michael grow up, and she was there for all of those important moments. That’s what gave her the strength to keep up the fight. And she can’t stop now. She can’t take the chance that this won’t work and there will be no one left to fight the AI. And Michael finally seems to understand. Oh, and Georgiou has turned off the amplifier, stopping the download to the Section 31 ship. Leland beams down the Essaf IV and starts firing. He reactivates the data amplifier, but this time, Spock realizes what’s going on. The Section 31 ship now has 37% of the sphere data. Pike won’t beam out his crew because Dr. Burnham has no other defense, so they’re just firing right back. Plus, the containment field is weakening. Somehow, Gabrielle realizes this as well, and tells them to drop the containment field. But first, Leland’s able to shoot through it and destroy the suit’s time crystal. Leland’s about to shoot Michael when Georgiou attacks him, and Discovery can’t stop the data transfer. Leland even destroyed the control station, so they can’t beam Gabrielle into their timestream. They need to lower the containment field, and the suit and Dr. Burnham will be pulled back. Without a time crystal. she won’t be able to navigate through time, but at least she’ll have a chance to survive. Michael promises to find her again, and she and the Disco crew shoot the discs controlling the containment field. Leland is still busy with Georgiou as a micro-wormhole opens and pulls in the suit and Dr. Burnham. Michael calls for beam-out, leaving Leland behind. When confirmed that they’re on board, Disco fires torpedoes to destroy the research facility. But they weren’t fast enough – it appears that Leland was able to beam back to his ship and it’s warping away, and disguising it’s warp signature. But they’re also picking up an escape pod, with Tyler inside. In her quarters, Burnham is one again watching her mother’s log, specifically one in which she promises to come back. 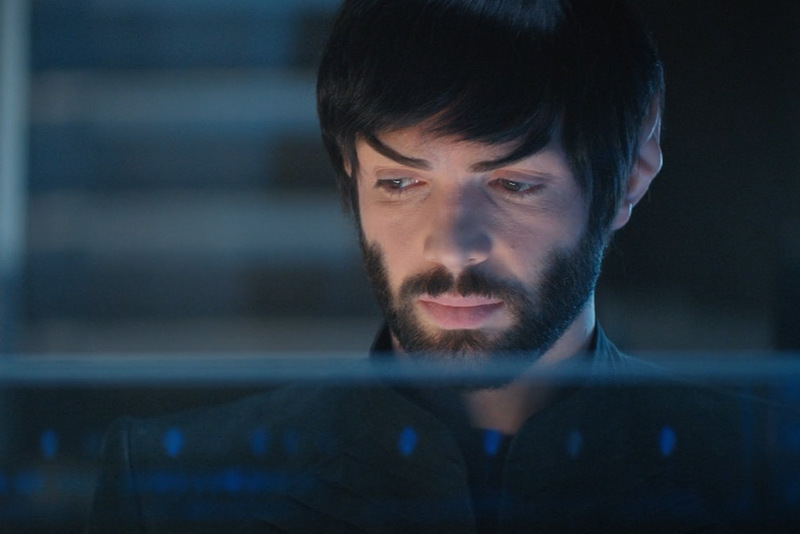 Spock stops by, telling Burnham that Leland was able to get 54% of the Sphere data. But they’re going to keep fighting. But Burnham is feeling hopeless – everything they’ve tried has failed. There’s no suit. No time crystal. No mom. And the AI has the advantage. Spock, however, believes that they can change the future from right where they are. Now matters, and that is the real advantage. “All of history can change with our next move.” He’s reset Michael’s chess board, and it’s her move. Next week, a new signal (4th of 7) has appeared, this time over the Klingon planet Boreth. Where is just so happens that L’Rell and Tyler’s son is being raised in a monastery. Also, a bunch of Section 31 ships show up.